Sunny Dae Goldendoodles Apalachin, N. Y. "Where exceptional temperament and classic beauty come together"
We are committed to breeding beautiful doodles that are healthy, happy, well tempered and gentle. 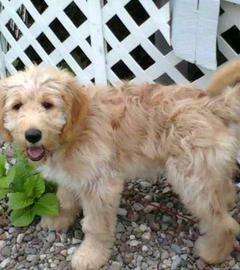 A puppy from Sunny Dae is more than a doodle, it is a companion who will be a part of your life for many years to come. Check here for extra pretty puppies, and great personalities by a highly recommended, licensed breeder. Click on Aussiedoodle Pups to see pics.